Have you have met someone who’d been up since the crack of dawn and they were functioning? Did you wonder how that was possible? At first, they probably annoy you because they are so happy in the morning, but you secretly wish you could be them. Think about all the things they accomplished before noon. Mornings are rough if you like sleeping in, but they are not impossible. Everyone has a routine to help them get out of bed. If you set multiple alarms it will help annoy you out of bed. It’s a reminder you have things to do. I promise if you blare a great soundtrack you will be in a better mood almost instantly. Spotify got us covered. Hit the gym in the morning! Getting your blood pumping will help wake you up. It doesn’t hurt to get your workout out of the way. Also, the empty gym is a plus! As long as you stay awake in the shower, a cleanse can help your bleary eyes and bed head! Pick an outfit that you want to wear! Lay it out the night before so you don’t have to think about it. Don’t be ashamed if you’re hype about your grunge outfit-- those can be the best outfits! Before falling asleep picture that delicious breakfast you’re going to have. Start your day off right! Giving yourself time to lay low and wake up. Penciling this time in will let you be more focused in class. Sleep is important! Young adults tend to need 7-9 hours so plan ahead! Keep in mind it will take a week of two for your body to adjust to the new bedtime. 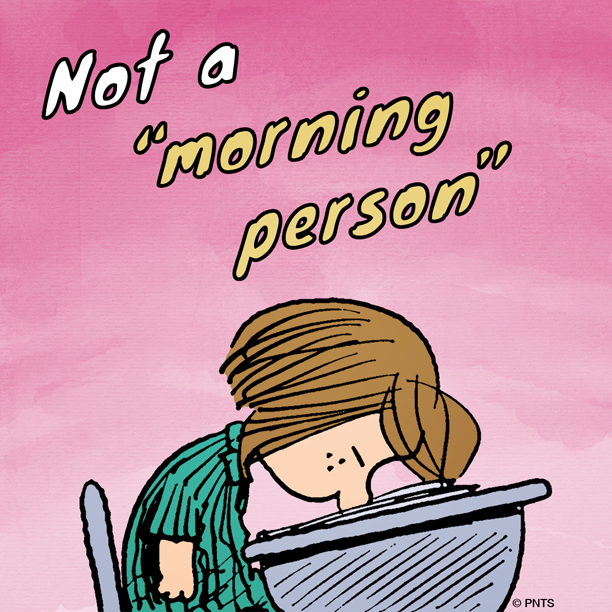 The first two weeks of early mornings will be rough! Don’t give up. It will get better! Sometimes you just need to push yourself to achieve your goal.